Here's a little quiz for photographers: Without looking up the answer, what does the f-stop on a lens represent? I'm not asking what it does. Obviously the aperture regulates light, and higher f-stop numbers let in less light. But how is the actual number arrived at? What does 2.8 or 5.6 measure? A free print for the first person to correctly answer. 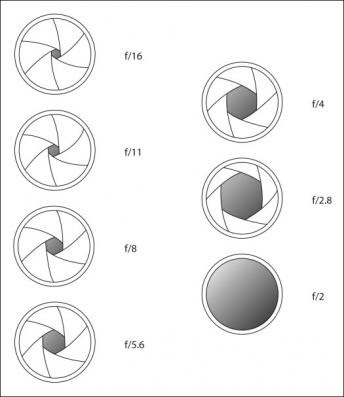 It's the focal length divided by the diameter of the aperture. As it is marked f/A, it means f divided by A. And the result is diameter of the aperture in millimeters. F-stop is a simple ratio and you compare f-stops on a relative basis rather than absolutely. A lens is circular. We can measure the amount of light entering through the lens by determining its area. The area of a circle is Pi * r^2. To double the area, r simply needs to be multiplied by the square root of 2, because the square root of 2 squared is 2! That's exactly why the values above differ by that seemingly arbitrary number. My email is in the mail!